“German court sentences 94-year-old ‘Bookkeeper of Auschwitz’ to four years in prison.” Is this Justice? Or is this the German Judicial System’s attempt to atone for its appalling failure since WW2 to bring more of the real culprits to justice? This is an obvious choice of topic for my July blog for it touches on all my main themes: WW2 Germany, prison, punishment, forgiveness, redemption. What we have here is a 94-year-old former SS officer whose job at the age of 21 was to sort the luggage of the new arrivals to Auschwitz and register the prisoners’ goods and valuables. Oskar Gröning was not a guard but a bookkeeper who counted the money the Nazis stole from the Jews. 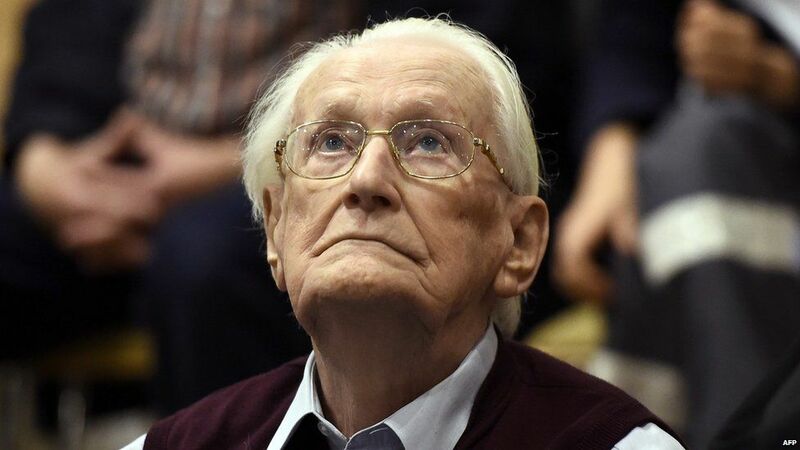 During the trial that started in May in the German city of Lüneburg he admitted: “It is without question that I am morally complicit in the murder of millions of Jews through my activities at Auschwitz. Before the victims, I also admit to this moral guilt here, with regret and humility. But as to the question whether I am criminally culpable, that’s for you to decide.” Today he was sentenced to 4 years in prison after the German Courts found him guilty of being accessory to murder of 300,000 people.